The Solid Dog Polo in Ultra Violet by Doggie Design is a sporty look with their signature logo on the collar. 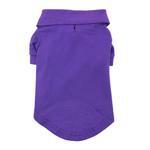 This 100% cotton pique polo will be a great way to have your dog stand out. 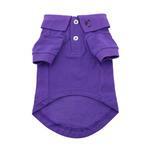 We love the vibrant purple of this classy dog polo. It would be a great choice for Easter. It would be a classy look on the golf course or at barbecues. Solid Dog Polo by Doggie Design - Ultra Violet Customer Photos - Send us your photo! I love the polo but it has no stretch at all so should have gone a size up but Kiki was a good sport about it while I got some pictures! Moofasa, AKA Mr. Moo who is a rescue from Merit Pit Bull showing off his new polo. He turned his collar up because he likes to be cool! Posted On 04/19/19 by Kasey S from Syracuse, NY Yes, Kasey S recommends this product! The sizing chart isn't accurate so I would go a size up because it does not have any stretch. I got it on Kiki and it was really tight and even harder to get off! Posted On 04/08/19 by Pauline P from , CA Yes, Pauline P recommends this product! Love this shirt. But neck is way to big. I am trying to figure out how to shrink the neck. Any ideas? This shirt ran very small. Had to return it, I did not reorder it. Posted On 05/08/17 by Betty P from Bakersfield, CA Yes, Betty P recommends this product! Purple is his favorite color - and it's easy to see why in this VERY PURPLE shirt!